Want to make a splash with your pool building business? If you think writing blog posts is the full extent of content marketing, sadly you’re mistaken. And you’re missing out on loads of traffic and customers. Outbound marketing used to be all the rage, but marketing has evolved. Businesses used to rely on invasive cold calls and spammy advertisements. Then came a far less intrusive method: inbound marketing. A large component of inbound is content marketing. Valuable, quality content can be your secret weapon. 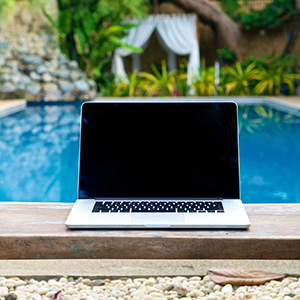 You’ll gain more customers in your pool building business, but it shouldn’t stop at blog posts. 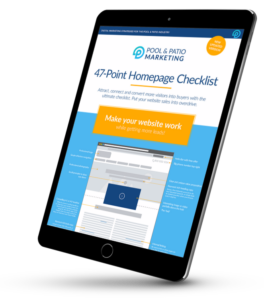 Not seeing the sales you’d like in your pool building business? Keep reading to learn about the different types of content marketing. Are you looking for reoccurring customers? Or customers who rave about your business? Offer them invaluable information. The information they won’t find anywhere else. You’ll have customers lining up to purchase your products. Instead of offering a meager FAQ section on your website, offer a guide, a how-to post, or the ever so popular list post. It all comes down to addressing the pain points of your customers. Providing knowledge that leaves them feeling like they’ve learned something new and worthwhile. First, you must do your market research to figure out what your customers are dying to know. Then, you can create long-form content guides or how-to posts. Keeping in mind what your customer’s burning questions are. Chances are, your customers are going to have boatloads of questions about your services, maintenance of their newly-installed pools, and more. Get creative with the types of content marketing you use. It can get tedious and dull for your readers if you’re only producing conventional blog posts. You’ll blur into the background instead of standing out from the crowd like you should in this competitive industry. You can’t turn your computer or iPhone on without coming across a video of some sort. Whether it’s on Facebook, Instagram, a blog post, or a website. Video marketing is taking the world by storm. According to this study, by 2021 videos will make up 82% of all consumer website traffic, worldwide. The study above mentions the immense development in the usage of live videos. By 2021, they stated live videos will make up 13% of all video traffic online. Making live videos a tactic you can’t afford to ignore. The pool building industry is perfect for video content. You have the ability to create videos to help your readers with a variety of issues. New pool owners will have a myriad of questions about their recent purchases. Providing them with the answers to their questions will make for happy customers. Not to mention it’ll save you loads of time answering phone calls and emails. You’ve seen them. Those long graphics with a slew of data and information. Sometimes they’ll reiterate what the blog post has already said. Like a bonus visual to break up your content. To make it more appealing and provide more insight on the topic you’re covering. But they can also be used on their own or even on social media. The sky is the limit when it comes to infographics when they’re well-done. Either way, if you’re looking at various types of content marketing, infographics are a top-notch choice. Infographics allow you to communicate any point across in an original way. They’ll be a breath of fresh air for visitors who land on your content. But you must do them right. If they’re not done professionally they can become information overload. If you’re looking for robust types of content marketing that’ll spur a positive reaction from your readers, you’ve found it. Case studies can back up how valuable your products are. Without you having to scream about your pools from the roof-tops. Using real-life examples your customers can relate to makes customers feel safe. And more likely to make purchases and leave positive reviews. Content gets regurgitated over and over. So it’s refreshing to have truly original content. 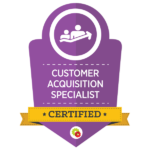 That’s exactly what your customers will get, with case studies. No two case studies are alike! You know you have a stellar case study if it tells a story. If customers can relate to that story, you’re doing something right. If your case study doesn’t do those two things — you know it’s not going to be useful to your audience. Case studies are an all-around irresistible form of content. Well, they may be an investment up-front, their ROI can be huge if you pull it off right. Blog posts are the foundation of any effective content marketing strategy. But it shouldn’t be your only strategy. Not when there are loads of powerful types of content marketing tactics you can be utilizing. It’s also vital to not forget about your actual website design. First impressions are all you have. 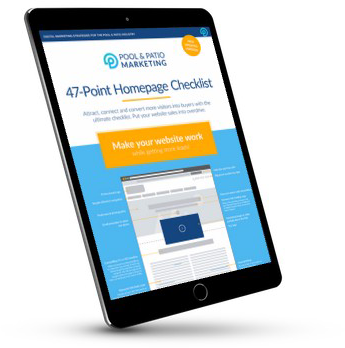 Make a point to create a professional website for your pool building business. 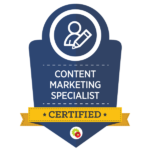 If you have any questions about content marketing, we’d be happy to help. Contact us. Blog posts are the foundation of any effective content marketing strategy. But it shouldn't be your only strategy.